Once again I’m reminded of the importance of self care. I’ve been feeling off all week since I ingested some lemon essential oil. I know that this is a great detoxifier and added a couple drops to my water because I felt like I needed a good detox. The next day I woke up with an upset stomach which didn’t really go away all week. I didn’t have any other symptoms, flu or otherwise so I did feel like I was just removing a lot of toxins from my liver but they weren’t actually leaving my body no matter how much lemon water or green smoothies I drank. All week I’d been aware that I was avoiding meditating and journaling and doing any of the other things that helps bring my mind, body and soul into balance. I was feeling lethargic and starting to notice a little bit of depression creeping in. This morning I woke up, still not feeling 100% though I finally felt ready to write in my journal, meditate and face whatever this was. 10 pages later, my stomach is no longer bugging me. What my body was trying to release was not just physical toxins, but past traumas and anger. 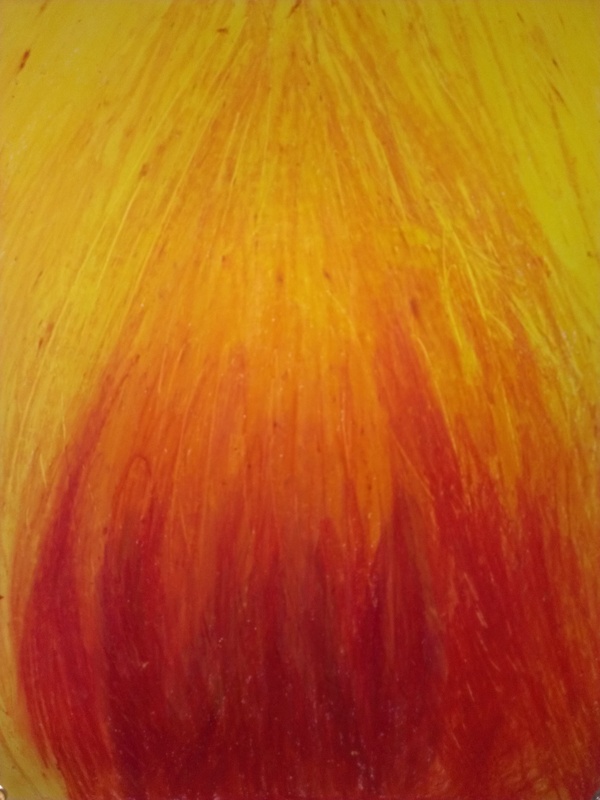 After journaling I cleared away all that I was holding onto with a smudging ceremony and was inspired to draw a flame with my oil pastels. I felt it was important to create a visual image I could use to remind me that I am powerful. As I was drawing and colouring, I realized the flame is such an important representation of my power. My flame is always burning, but sometimes I choose to let other people dampen it. I will now choose to remember that I control how bright my flame burns because when I give my power away, I become lethargic and unmotivated. As I coloured, I allowed my inner flame to grow inside of me and to burn brightly. The more I did this, the more motivated I became to spend the day creating. I spent some time hooping and working on the Yin Yang Hoop Dance workshop I’ll be offering at Spin Milk 4. I spent some time rearranging “my room” as I like to call it. It’s a spare room that I have set up for meditation, journaling, yoga, hooping and whatever tickles my fancy. It’s my self care oasis. I reorganized my bulletin board so I could hang my flame on it and see it on a regular basis. I was inspired and motivated to blog about my experience and after this I’m still feeling inspired to go to the grocery store and pick up some ingredients to create tasty dehydrated snacks! I know how important self care is yet sometimes choose not to make it a priority. Today is just another reminder that taking care of myself is a practice and I’m not perfect at it, but when I choose to take care of myself first instead of distracting myself with mindless activities or doing responsibility type stuff, I’m much better off for it. Self care makes me come alive and invites me to step into my power as a creator. The flame reminds me to keep stoking my inner fire so I can shine my light out to the world.